The greatest compliment I can receive is a referral or an online review!! Please kindly take a minute to help us! 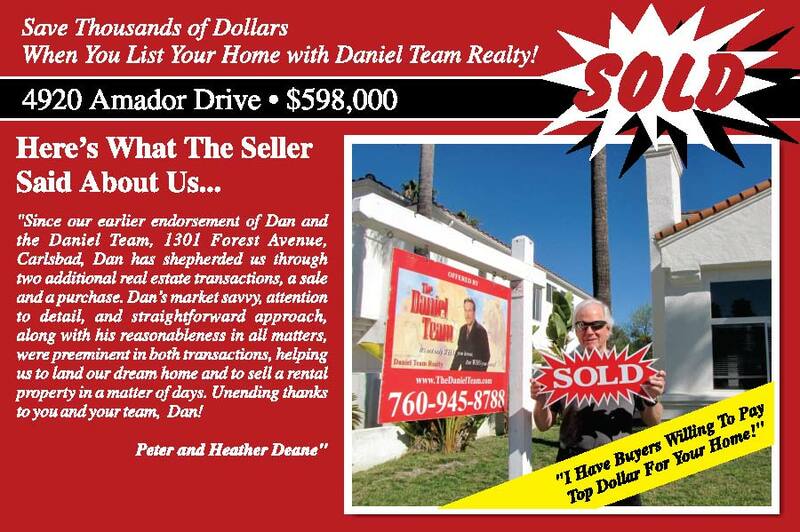 “Dan has been our realtor for over seven years. 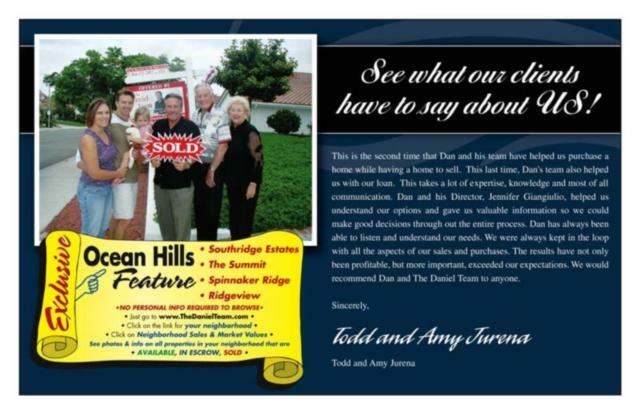 “Dan’s knowledge and expertise really showed during the negotiations and got us much more than we ever imagined. His marketing plan brought in thirteen offers in the first week we were on the market. He explained each offer to us and got us the one that was the best for us. He is innovative in his approach to sales and made us feel secure and comfortable about our questions and concerns. His honesty was truly refreshing. He’s tremendous! I believe it took me too long to write this letter of appreciation on your behalf and that of your professional team and wonderful family. But, I also believe it is never too late to say THANKS! My wife Andrea and I are forever grateful to you and the competent family of people that surround you. Our life has changed forever since the moment you were recommended to us as an excellent realtor and we made that first call that would later put us on the road to home ownership. 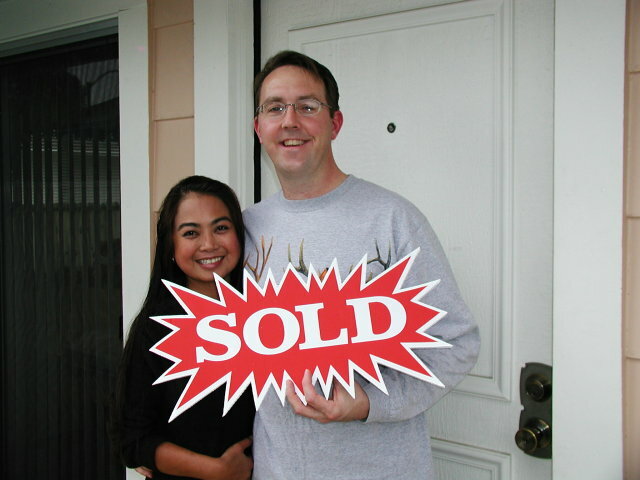 Buying our first home while the economy was booming was very challenging since the market was very competitive. Being first time buyers also added stress on the process. There is a lot of confusion, little knowledge about how things work and many questions. But, you Daniel, instead of capitalizing on the confusion, guided us, explained us, and assured us that we were going to decide what we buy and when we buy. You laid out the advantages of buying then and the risks of waiting until our finances improved or we felt more confident. Your words of advice are still fresh in our memory and I am very glad we trusted you. 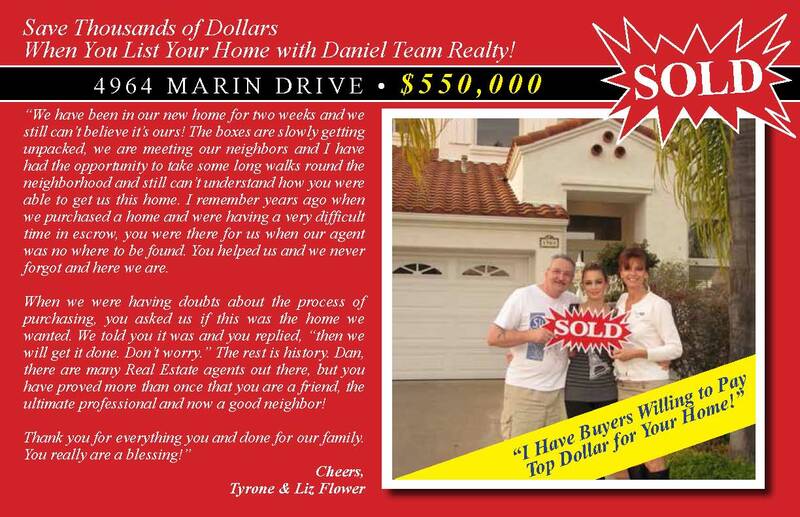 We bought our first home in 1999 and within 3 years it nearly doubled in price. 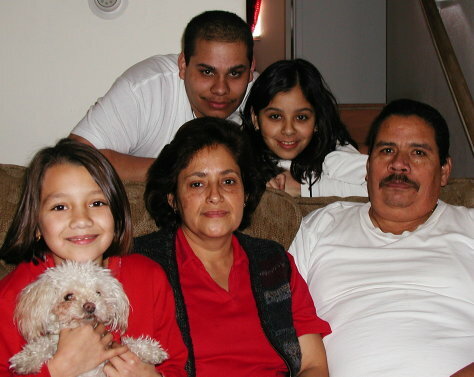 We were blessed with much more then we hoped because our American dream came with a bonus, equity. I am glad I stayed in touch with Daniel’s team the whole time. 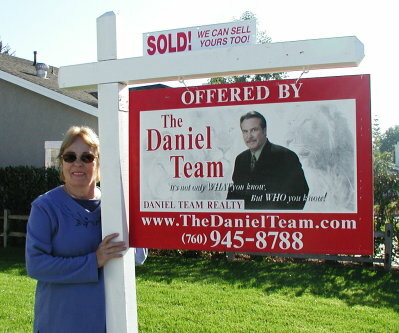 Watching the Real Estate market and also watching you Dan realize your dream of starting our own Real Estate company, the “Daniel Team Realty”. About a year and a half ago, we decided to take that next step of selling our first home and buying a newer and bigger home. After all, we had the most competent realtor on our side. The transition of selling a home and buying another one isn’t an easy one. Dan’s team however made it a smooth one. 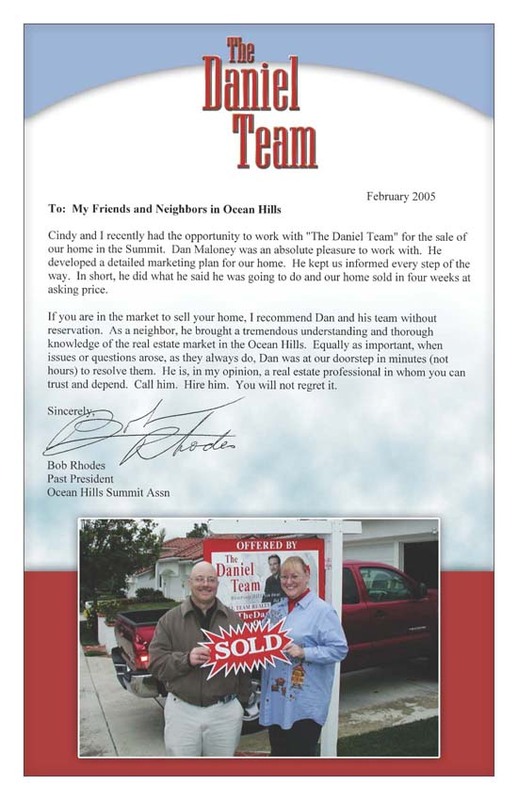 I learned then that Dan’s team does not just mean those in the same office as Dan, but rather a network of friendly and trustworthy people such as lenders (real ones, not middle people), escrow, etc. With Dan, every problem had an answer, The result was a wonderful two story, brand new home that my family has been enjoying for over a year. 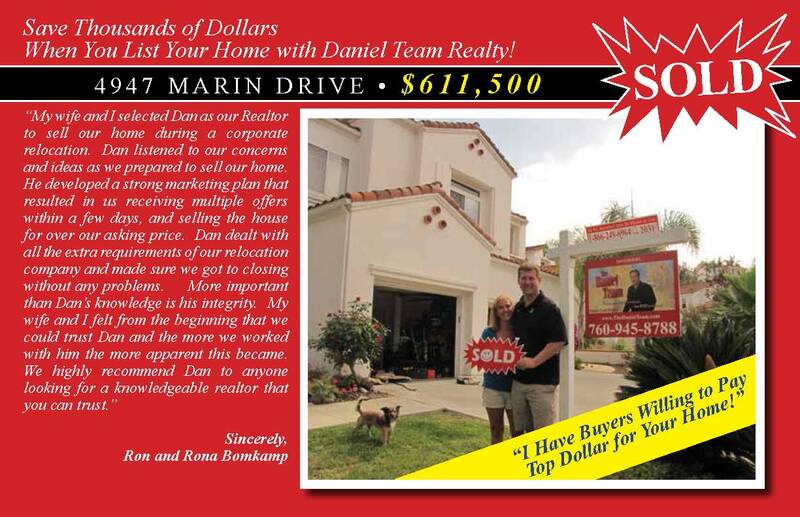 No matter how many times I buy or sell a home Dan, considering how well you have done for my family, I feel I would choose Daniel Team Realty over and over again, I wholeheartedly wish your family and your team the best success and happiest life. I want to write a letter of recommendation for you in appreciation of the innovative and professional way you worked with me, the Real Estate Agents, and their prospective buyers, the escrow company, the attorneys and the title company. It is very unusual, in my experiences, to find anyone able and willing to take on so much responsibility for a client. Thank You! I wish to inform you as to why I feel you will want to list your property and/or otherwise work with Mr. Daniel Maloney in acquiring or selling real estate! 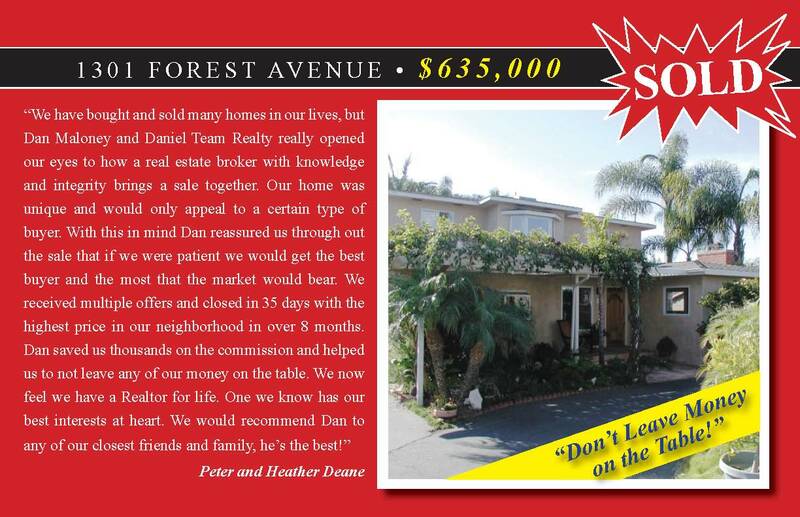 We have had a most unusual experience that moved against all odds of the property being sold. Other agents that I contacted insisted that the property should be considered distressed property and sold at a tremendous loss. Mr. Maloney acknowledged that it was a challenge, but one that, with considerable work, could be managed with sucess. Our challenge was that I had repossessed the property and placed fifty names on title! These were investors whose funds had been used to buy this property. The former owner was indicted for his misdeeds and the U.S Attorney General felt the property was to be his under court order. We spent over a year trying to get the problems resolved! 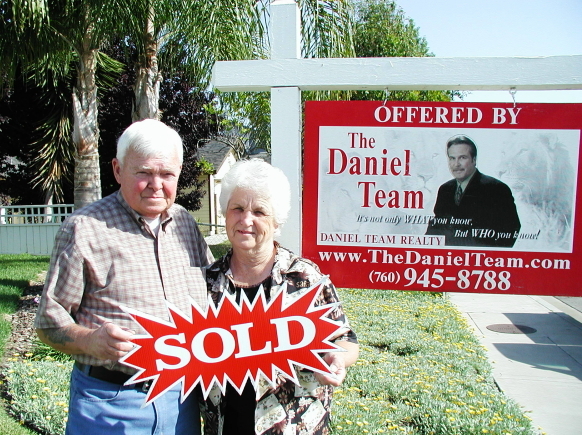 Thanks to the aggressive and innovative efforts of Mr. Maloney,we finally sold the property. 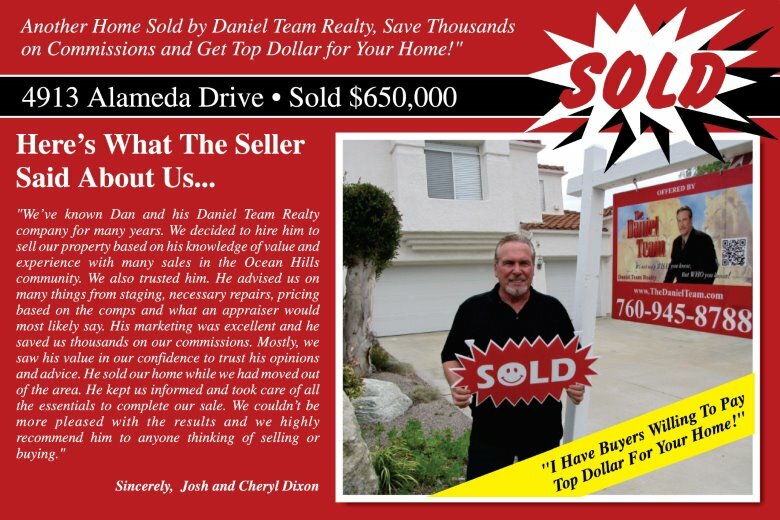 Mr. Maloney was patient, understanding of both sides of the problems that arose, and professional to the point of exhaustion as he labored with the buyer's agents, escrow office and my attorney to achieve the desired outcome. 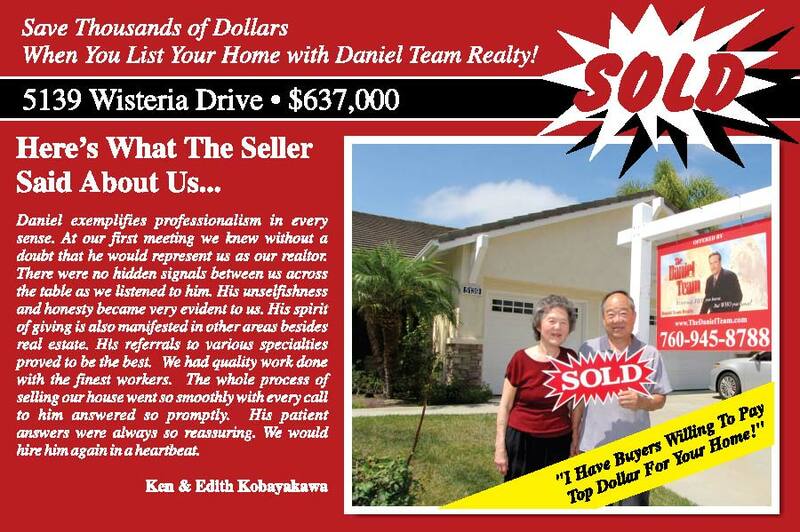 Had it not been for his real estate knowledge and persistence, we would still be struggling to sell the property. I can assure you that my experience proves that Mr. Maloney will work for you and with you in a manner truly uncommon in today's business world. I offer the highest recommendations for Mr. Maloney and if you have any questions or want further comments concering this abilities displayed in the sale of my property, pleas feel free to call. The man knows value, market, techniques and professional courtesies to render the very best service for your real estate needs. 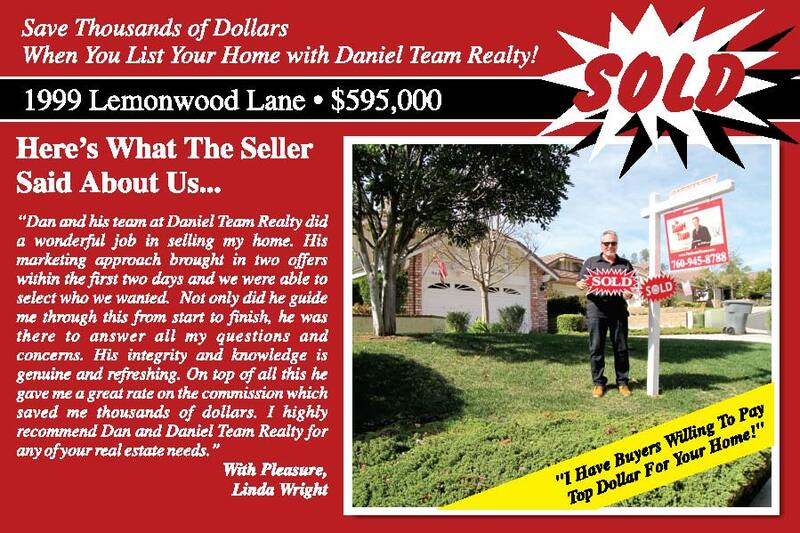 This is a letter to express our thanks and appreciation to Daniel Maloney of Keller Williams Associates Realty. 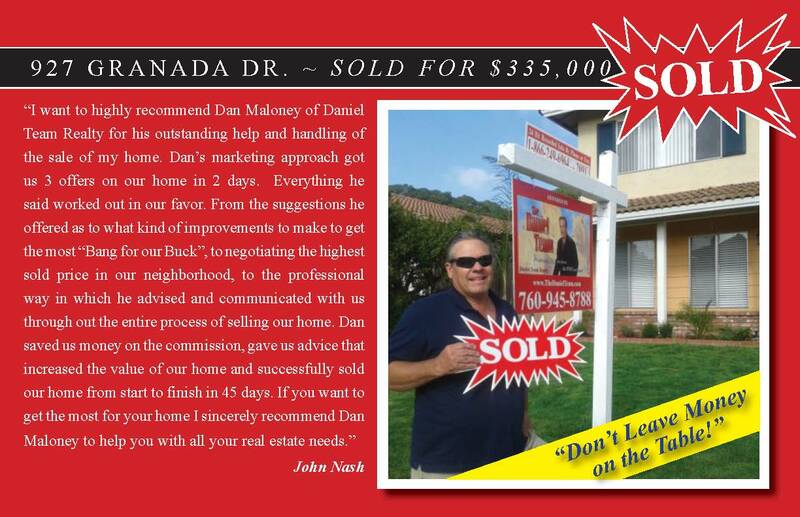 He helped us in many ways to sell our home at 3137 Avenida Olmeda in the Meadowridge Complex of La Costa. 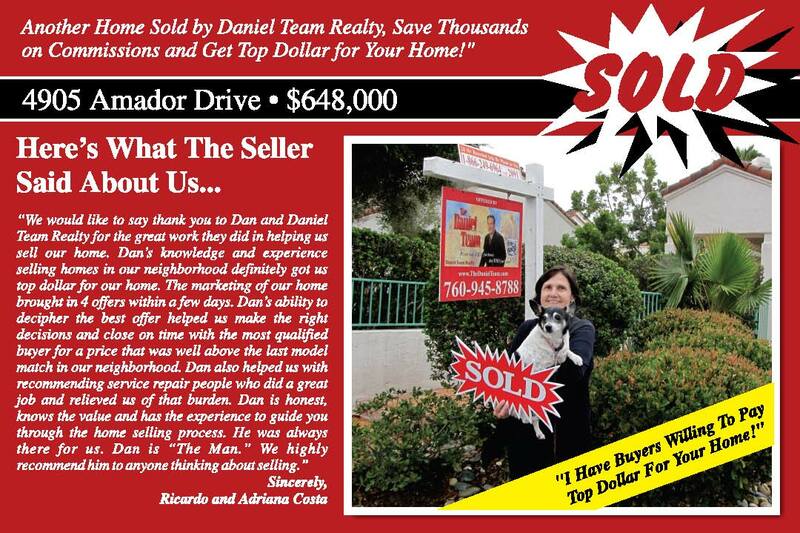 I first met Daniel back in 1997 when he helped us find and purchase our home. Not only was he very meticulous and knowledgeable about the market then, but he genuinely concerned for our needs. 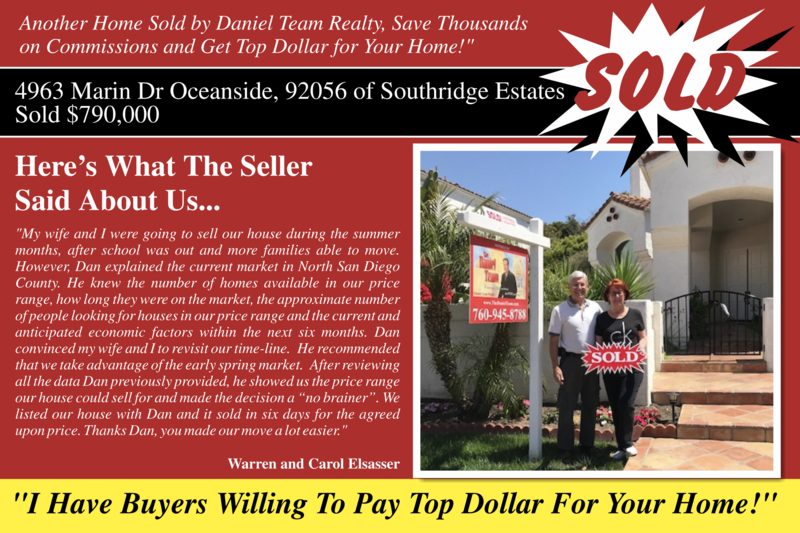 Daniel listened, which I feel is most important, as many realtors do not really listen to what your needs are, but try to SELL you what they think you need. He found us what we were looking for and negotiated the transaction with our needs as the number one priority. 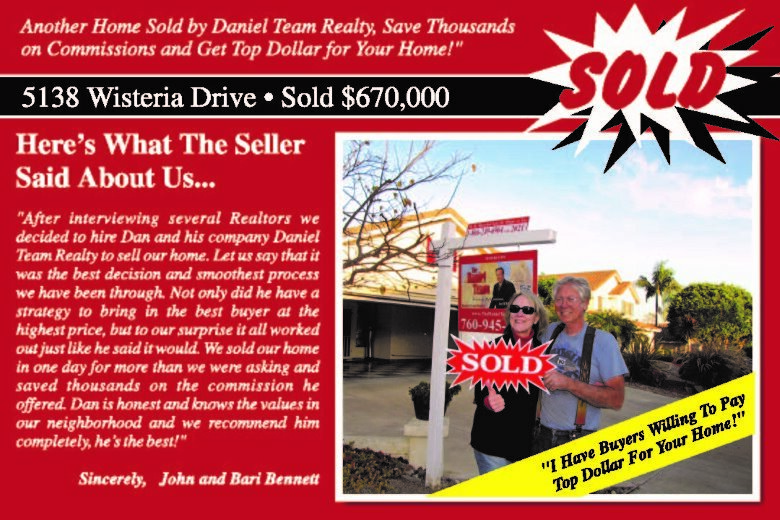 Our experience with Daniel as our real estate agent was refreshing, as well as profitable. 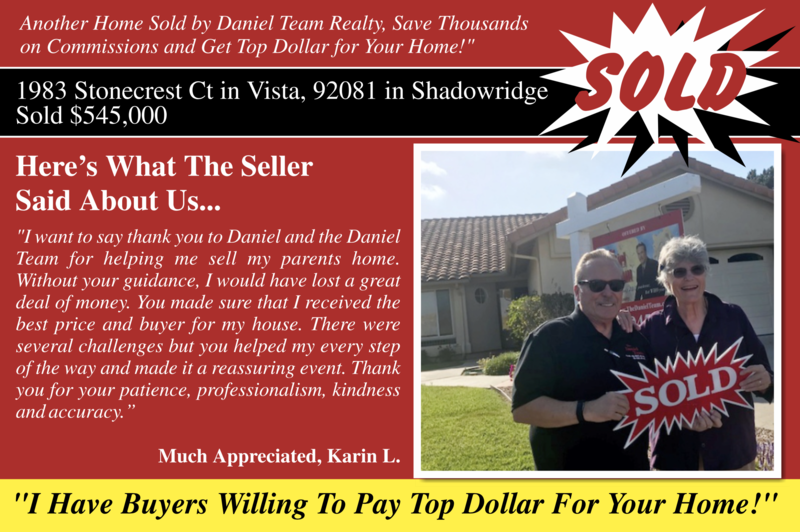 When my wife and I decided to sell our home we immediately called Daniel, who had maintained contact with us after the completion of our purchase. He came right out, listened to our needs again,, and came up with a game plan to not only met our needs, but surpass them as well. 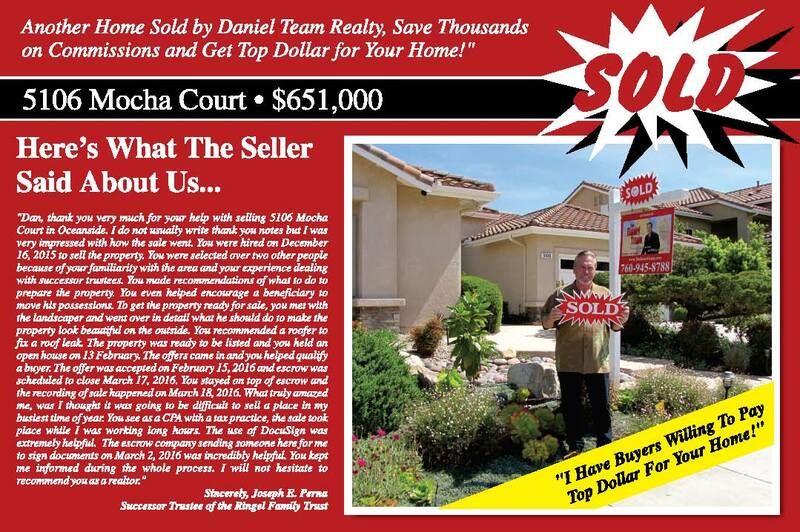 Again, Daniel was current on the market trends and knowledgeable about the best ways for us to sell our home. 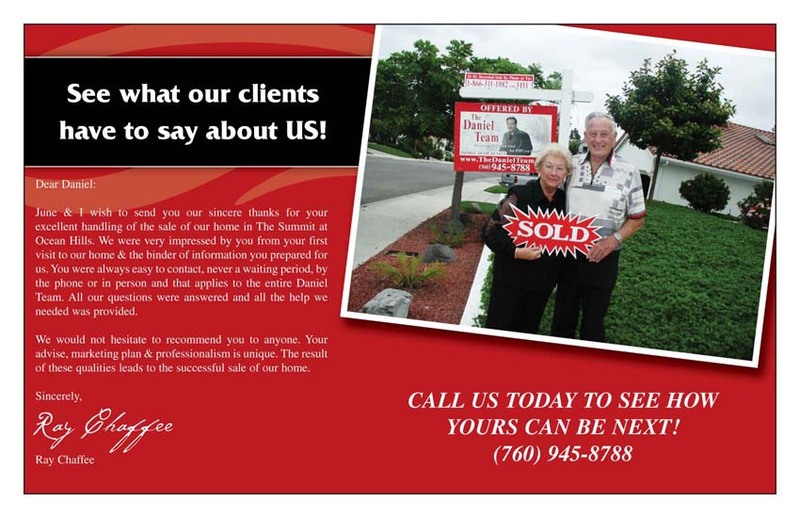 What I appreciated most of all was that he informed us to the point that we knew as much about a real estate transaction as we had ever knowen. He was prompt, kept us informed continually about each aspect of the sale, and made us feel completely at ease as far as whose interest he was concerned with. 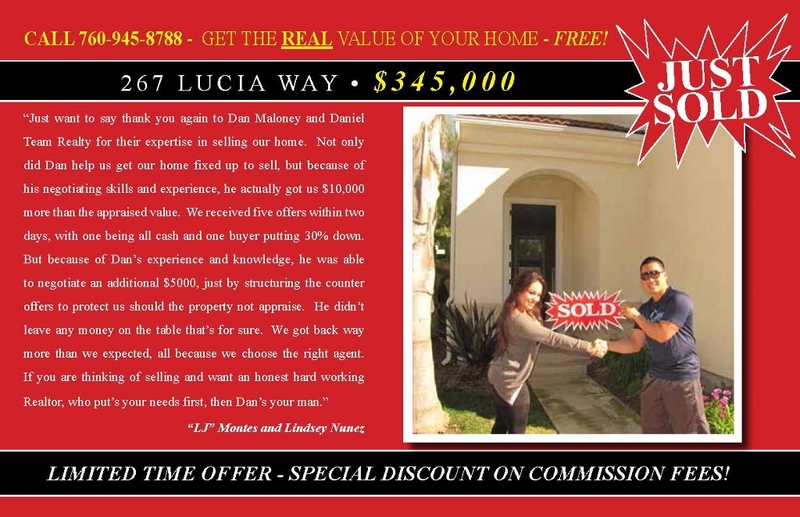 I would highly recommend and endorse the service of Daniel Maloney for all your real estate needs. He is extremely competent, trustworthy and a real pleasure to work with. If needed, I would be more than glad to speak with whomever would want to, about Daniel Maloney and his service. Don and I first met Daniel at a garage sale for Mrs. Dorothy Burr on a Saturday in May, 1999. 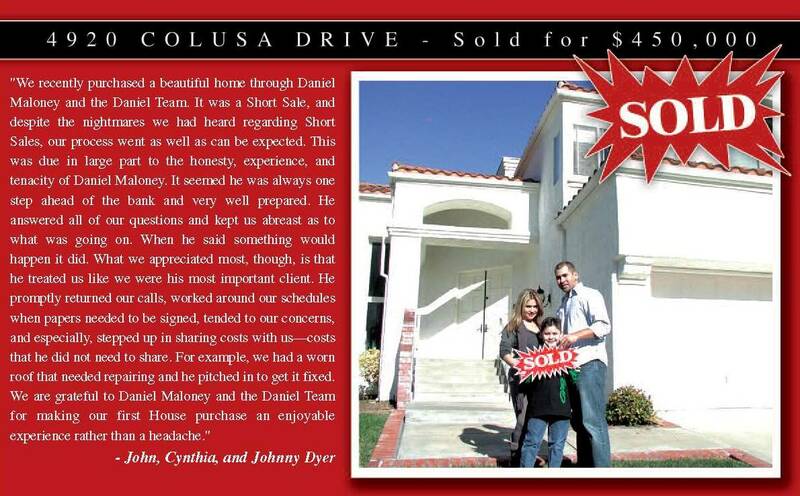 He was helping her and promoting the sale of her house, which he had listed. We were not interested in buying a house, but had some friends who were looking. We got a few details and called our friends. They told use they were not ready to buy yet. The following Monday, Don and I decided to look at the house for ourselves, we called Daniel and he met us at the house that same day. He presented the house in a friendly, relaxed, informative way. He answered any questions we asked and followed throught on the answeres he had to investigate. 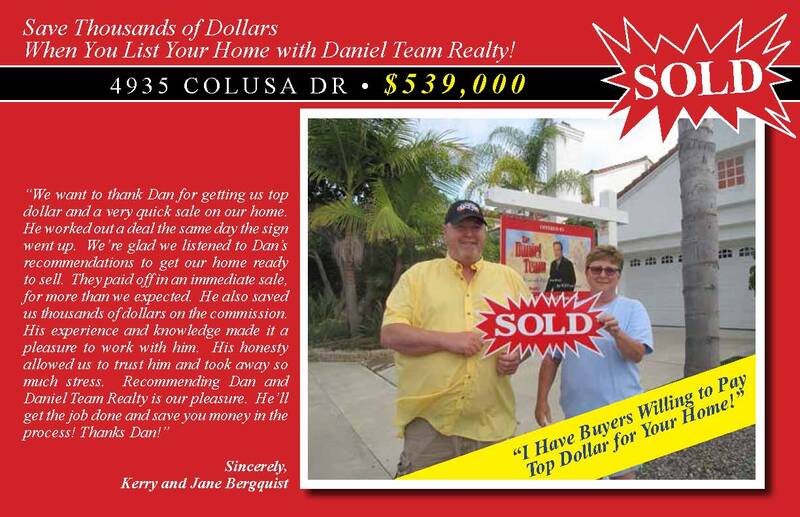 After reviewing the information given to use we called Daniel and made an offer on the house. He took uthe offer to Mrs. Burr, she counter offered, we accepted, all within a few hours of our decision. Daniel arranged for us to met Ray Nichols, Bruce Kaylor and Gretchen Baker. All knew their individual specialties very well. Ray Nichols came to our home to handle the mortgage loan papers. Bruce Kaylor included us at the inspection of the house, we also used the time as a walk through/information time. Gretchen Baker of West Coast Escrow took her time and explained everything and was patient and pleasant even though the loan papers need to be issued again. 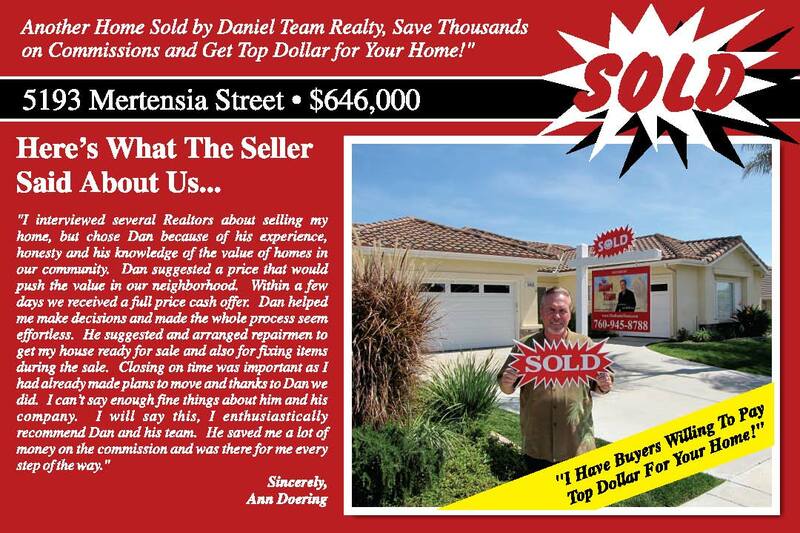 Daniel and his associates, have been courteous and through, better than any real estate dealings we have had in the past. Daniel explained the papers we need to sign, he covered every item until we understood exactly what we were signing. Daniel has handled all of our business transactions this way, even answering questions we had not thought to ask at the time.